We arrived in France (the 25th country we've had the pleasure of visiting) less than a week ago, and we're already smitten. There's so much to see, experience and savour. Montpellier is situated on the Mediterranean it's history dates back to Roman times. This impressive aqueduct is within walking distance of the old section of the city. Adjoining the aqueduct is the Peyrou or Royal Square with its decorative water tower. The square provides an impressive view of the city and provides the locals with a park area. To the right of the statue of Louis XIV on horse back are two canopy tents. Vendors were selling wine and barbecued meats and many people enjoyed a picnic lunch on the grass. If a picnic isn't your thing, why not enjoy the outdoor market that stretched around the perimeter of the royal square? The items for sale were as varied as they were impressive. In the next photo notice the vendor sitting off to the right. In front of him is an open bottle of rose wine and he's enjoying a glass between sales. The centre of Montpellier is home to two Opera Houses, one of which is below. The city tram service consists of four different lines that crisscross the city. 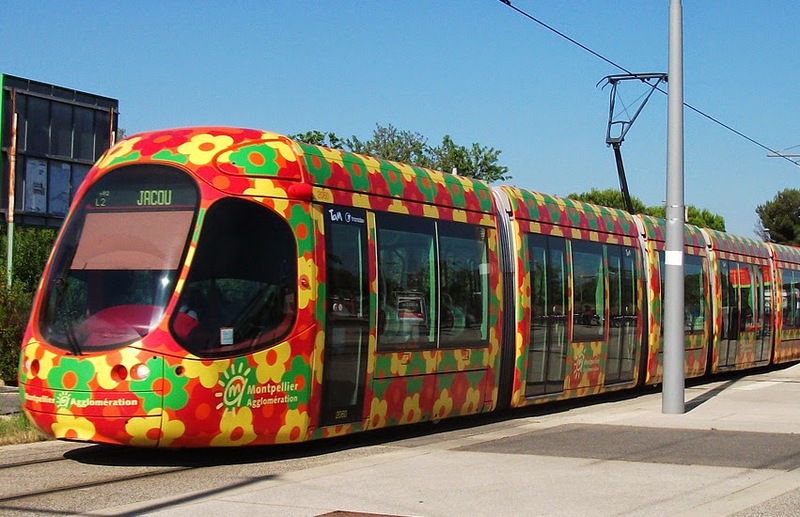 The flower tram runs north and south to Jacou (the destination of our latest house and pet sit). The blue line crosses Montpellier east to west, while the merry-go-round just goes, well, around and around! Outdoor cafes and restaurants line the square, providing a prefect place to eat, drink and be merry, watch life go by or enjoy one of the many street musicians. The historic part of town dates back centuries with narrow lanes and alleyways. We didn't have time to see it all and will definitely return for a more in-depth look. Last Monday our homeowners picked us at our hotel and showed us around Jacou before they left for vacation Tuesday afternoon. We enjoyed a delicious homecooked meal with wine (mais, oui) and that evening did what homeowners and housesitters do best - shared travel stories! We were also introduced to the two reasons we came to France...Jake and Petra. Jake is a Green Cheek Conure, 20 years old, almost blind from cataracts and he loves crackers. Next to crackers he adores red pepper sliced, diced or on the stem. Did I mention his passion for red pepper? Petra is a Sun Conure and 13 years old. He enjoys climbing to the top of his cage where he can see everything that's going on around him and from that vantage point likes to pretend he's Top Bird (until Jake puts him in his place). Their little spats are few and far between, however, and when they think we're not watching the two groom and coddle each other. It's too cute. The first few days of any housesit we devote entirely to the pets. We stay close so they can get to know us. We are, after all, strangers in their home. Our goal is give them time to accept us as their temporary human caregivers until their cherished homeowners return, and as you can see from this next photo John seems to have won Petra over while he's plying Jake with a slice of red pepper! Did I mention Jake likes red pepper almost as much as he does crackers? !